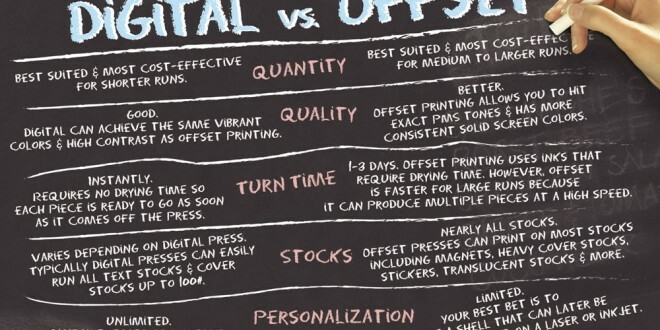 Home | Printing Services | Printing Basics | Offset or Digital Printing? During the last decades, fast advancements in electronics and computer science have definitely changed printing industry forever. The main innovation is, without doubt, digital printing, which brought new options for commercial printing. But more options often bring some difficulties for clients in making a decision: offset or digital technology? Offset lithography is the traditional method, still largely used for printing high-volume orders. The image to be printed is burned onto a metal matrix and transferred to a rubber roll or sheet. The rubber roll passes through an ink reservoir and, finally, the image is printed on paper. This is possible by using hydrophobic ink. The image on the rubber part gets ink, while the rest does not, because they attract a thin water film. While the basic principles of this technology remain the same, the printing machines have significantly evolved. Using computer-to-plate image transfer, they also entered the digital era, allowing an even higher print quality. The printed image has a higher quality. It can be used not only on paper, but also on fabric, plastic, leather, wood, metal etc. It is much more economical when printing in high volumes. This means that the more items you print, the lesser the cost-per-unit will be. Nowadays, almost everyone owns an inkjet or laser desktop printer. Such new technologies bring less mechanization and much faster computer-to-paper image transfer and are becoming more and more popular in the commercial printing industry. What Are the Advantages of Digital Printing? Printing with this technology is, definitely, much faster. While the many mechanical steps involved in traditional printing often mean more variations from sheet to sheet and miscounting, these problems usually do not occur in digital printing. For low volumes, the cost-per-unit is lower, when including setup costs. It allows variable data printing. This means that the printed information can be changed from one sheet to another, without slowing down the process. For instance, when printing personalized letters, the name and address will differ from one letter to another, while the layout stays the same. What to Consider When Choosing the Most Suitable Printing Technology? Think what the volume of printed items you need is. That is because the cost-per-unit evolves differently in the two technologies. For long runs, it is lower in offset printing. But, for short runs, digital printing is usually more convenient. What material is to be printed onto? For special paper types, plastic and so on, you may still use certain digital techniques, but offset printing is still the best option. What colours are to be used? For black-and-white or less than three ink colours, offset printing is more convenient. If you use the Pantone Matching System, offset is also the best solution, the match being more accurate than digital machines allow. But, for four-color printing (CMYK), digital technology offers lower costs. Turnaround is also an important factor to consider. If you need that order to be printed fast, it is much better to choose digital printing (even if some new offset technologies may also provide a fast turnaround). If you want to customize the output (for instance, the personalized letters mentioned above, customized marketing materials etc. ), digital printing is much more flexible and offers lower costs. For complex printing orders, you would certainly want to see proofs. Proofing is much more affordable and accurate in digital technologies. To conclude, for high printing volumes and special materials, offset lithography printing yields lower costs and higher quality. Otherwise, the new digital technologies are a much better option.